Well, it’s been a bit of a rocky start to spring, the severe snow and cold of March followed by a sudden and brief heatwave, and then more cold and heavy rain to wrap up April, a season of real contrasts and consequences for the wildlife along the River Tees. However, despite the weather, we’ve started our 2018 celebration of the Teesdale Way long distance footpath and kicked off the guided walks programme with a walk between Piercebridge and Broken Scar in April with the following section down to Hurworth planned for June. This is one of my favourite stretches of the Tees, reminding me of my childhood home on the banks of the River South Tyne. The river here has a voice, plenty of shallow sections running noisily over shingle and rocks, in contrast to the deeper, quieter sections as the river passes Stockton and Middlesbrough. It’s perfect dipper country and I’ve have spotted dippers in the past, near Low Coniscliffe and at Broken Scar. They are early breeders, often laying eggs in late March so at this time of the year, it’s a good idea to keep an eye out for the fledgling dippers. They hunt for aquatic insects along the bottom of the river, using their wings to move them along the river bed as they search for mayfly and caddis fly larvae under stones and pebbles. The youngsters lack the smart dapper plumage of the adults, being more grey-brown above with speckled underparts but they still share the same distinctive rotund outline and bobbing action as if their legs were mini springs. It may be that the bad weather set them back so it will be interesting to note when the youngsters are seen; let us know if you spot any along the Tees. 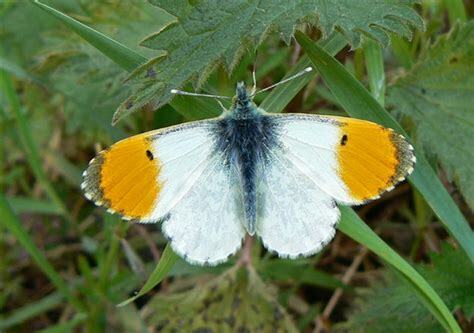 As well as fledgling birds starting to appear, another harbinger of spring is the orange tip butterfly though I have yet to see my first so far this year. I’ve spotted them in mid-April before, along the River Skerne downstream of South Park in Darlington and around the Sockburn section of the Teesdale Way and you’ll find them where their caterpillar food plants of garlic mustard or lady’s smock are growing. The glowing orange tips of the male butterfly’s wings give the species its common name; the female is mainly white above but has a beautiful mottled green underside to its wings, different to other white butterflies and perfect camouflage when at rest. These insects overwinter as a chrysalis, waiting for the warm days of spring to encourage the adults to emerge for a brief spell of around 18 days. The species only has one generation each year so they are truly a prime spring spot and definitely one to treasure.